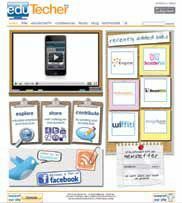 eduTecher.net is a free resource for teachers, students, and parents that focuses on using free Web tools in the classroom. The site has reviewed more than 1,200 tools and includes more than 45 videos explaining how to use them to teach. It recently launched “eduTechers Change the World,” a charity campaign in which each visitor to the site donates a penny to an aid organization. At the end of November, the users can vote to decide which charity will receive the money. For more details, visit the Change the World page, www.eduTecher.net/change.